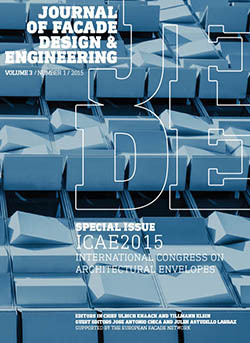 We are proud to announce that the Journal of Façade Design and Engineering is becoming a fixed partner for the scientific distribution of the ICAE International Congress on Architectural Envelopes, organised by Tecnalia San Sebastian. We are proud to announce that the Journal of Facade Design and Engineering is becoming a firm partner for the distribution of scientific knowledge of the ICAE International Congress on Architectural Envelopes, organised by Tecnalia San Sebastian. Tecnalia is one of the founding members of the European Facade Network EFN, and this partnership supports the development of JFDE with regards to the discipline of facade design and engineering. This issue of JFDE is dedicated to ICAE 2015, the VIIth edition of the congress. The contributions have been carefully selected from 32 abstracts, submitted to the scientific section of the conference. Subsequently the finished papers have been subjected to the regular blind review process of the journal. At this point, we want to thank our special editors Julen Astudillo and Jose Antonio Chica for their effort to make this partnership happen. The paper contributions show an interesting selection of approaches to innovative materials, form finding, simulation and climatic concepts. This demonstrates the special character of the discipline we are working in, bridging research, design and practice. Facade Design and Engineering is a peer reviewed, open access journal, funded by The Netherlands Organisation for Scientific Research NWO (www.nwo.nl). We see ‘open access’ as the future publishing model. But it certainly requires new financial models which we will have to explore over the coming years. 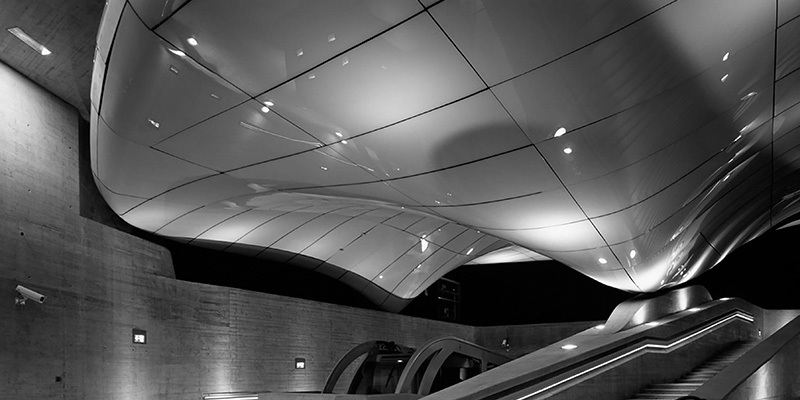 Free-form architecture is one of the major challenges for architects, engineers, and the building industry. This is due to the inherent difficulty of manufacturing double curvature facades at reasonable prices and quality. 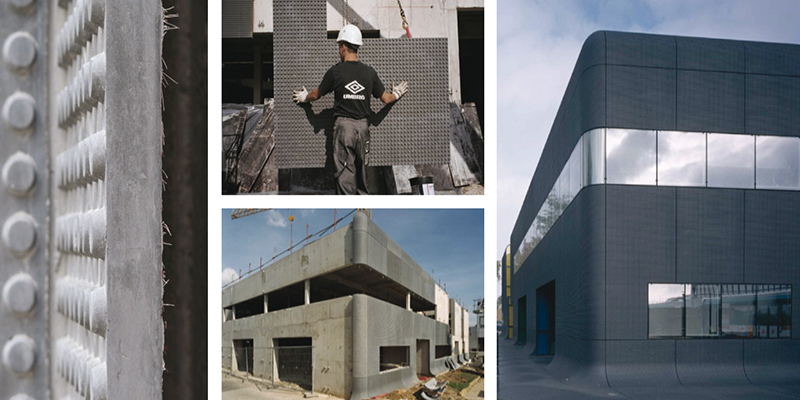 This paper discusses the possibilities of manufacturing free-form facade panels for architectural envelopes supported by recent advances in CAD/CAM systems and digital processes. These methods allow for no-mould processes, thus reducing the final price. Examples of actual constructions will be presented to prove the viability of computer numerically controlled (CNC) fabrication technologies. Scientific literature will be reviewed. Promising fabrication methods (additive, subtractive, forming) to accomplish this proposal will be discussed. This research will provide valuable information regarding the feasibility of manufacturing free-form panels for architectural envelopes at lower prices. In order to fulfil the current challenges for the European building sector, building design has diverged into two alternative directions: active technologies and passive design strategies. In the last few years, advanced and responsive building envelope components have represented a promising answer to these challenges. 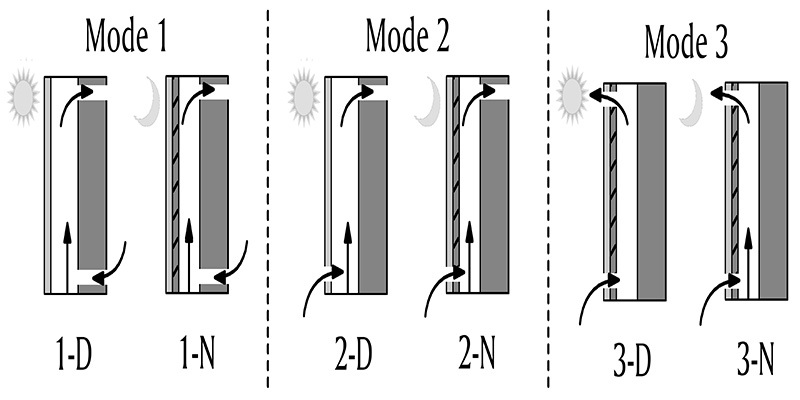 This paper presents the design and construction process of a project that aims to design, build and control the energy performance of an industrial-scale modular active ventilated facade prototype with a new Themoelectric Peltier System (TPS). The TPS is a thermoelectric HVAC heat pump system designed to be located in the building envelope and providing a high comfort level. Trying to optimize the energy performance of the traditional ventilated opaque facade, and make more efficient the energy performance of the TPS, the concept of adaptability has been applied to ventilated opaque facades. The essential research theme is to control the natural phenomena that take place inside the ventilated air cavity of the facade: taking advantage when heat dissipation is needed, and avoiding it when heat losses are not welcome. 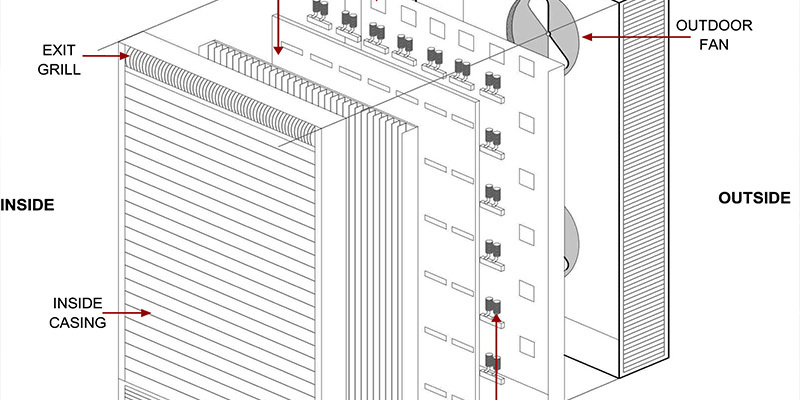 In order to quantify the previous statements, some facade prototypes are being built in Pamplona (Spain) and their energy performance is going to be analyzed during a year. In this paper, the authors present research into adaptive architectural envelopes that adapt to environmental changes using active materials, as a result of application of biomimetic principles from plants to architecture. Buildings use large amounts of energy in order to maintain their internal comfort, because conventional buildings are designed to provide a static design solution. Most of the current solutions for facades are not designed for optimum adaptation to contextual issues and needs, while biological solutions to adaptation are often complex, multi-functional and highly responsive. We focus on plant adaptations to the environment, as, due to their immobility, they have developed special means of protection against weather changing conditions. 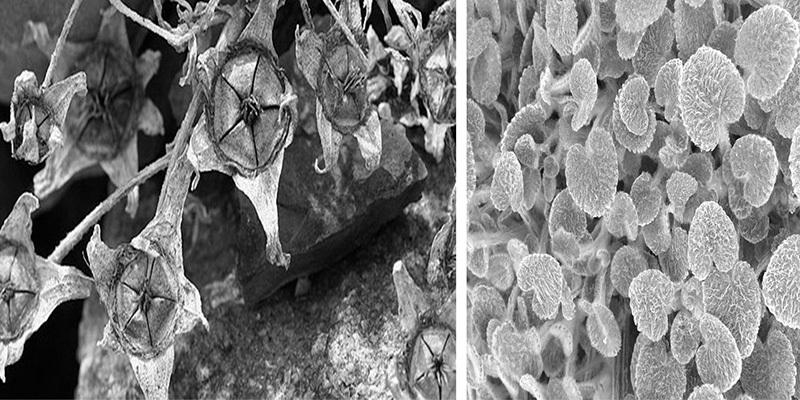 Furthermore, recent developments in new technologies are allowing the possibility to transfer these plant adaptation strategies to technical implementation. These technologies include: multi-material 3D printing, advances in materials science and new capabilities in simulation software. 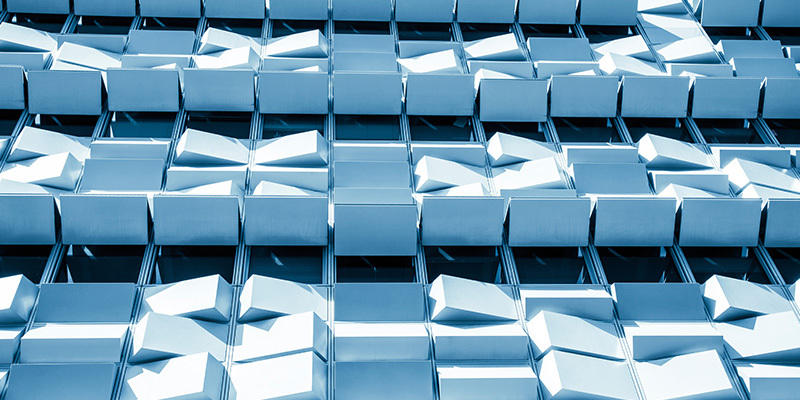 Unlike traditional mechanical activation used for dynamic systems in kinetic facades, adaptive architectural envelopes require no complex electronics, sensors, or actuators. The paper proposes a research of the relationship that can be developed between active materials and environmental issues in order to propose innovative and low-tech design strategies to achieve living envelopes according to plant adaptation principles. Unitized curtain wall systems have been widely seen on high-rise buildings’ facades by bringing benefits with regard to ease of construction, lightness, etc. However, some design and application problems related to structural and infiltration performance of a facade system might arise during its life cycle, which is difficult for the building to compensate. This paper presents a comparative analysis of the structural and infiltration performance of the two identically detailed and produced unitized curtain wall system mock-ups. 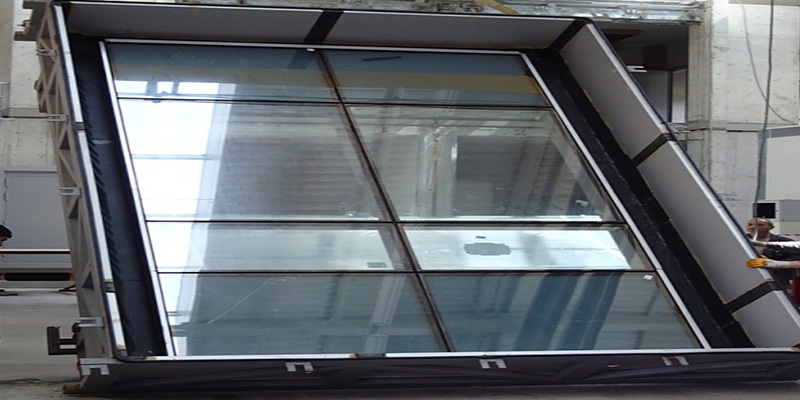 In order to understand long-term environmental effects on the curtain wall system, a fatigue process was applied on one system in addition to the standard test procedures, while the standard test procedure was applied on the other reference specimen. The tests on the two identical specimens were conducted in accordance with TS EN 13830 and AAMA 501.4 Standards. As a result of air infiltration and wind load resistance tests, air infiltration and frontal deflection values on the facade surface were obtained. Hence, experimental performance of the systems was compared and the effect of the fatigue procedure on the facade performance was evaluated. Almost all industrialized materials commonly employed at engineering and building construction are approximately unstretchable, metal sheets, plywood or glass. So there is no doubt about the advantages offered, mainly from the economic point of view, by the processes that use flat or developable surfaces in the resolution of doubly curved ones. 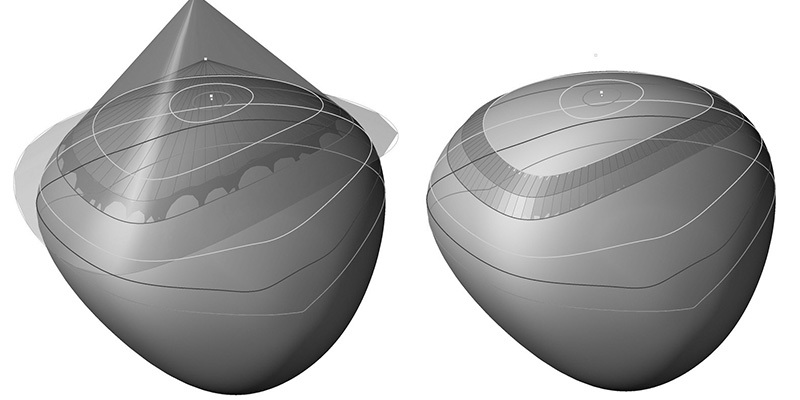 Using two prototypical kinds of developable surfaces, an adaptation method of double curvature surfaces is formulated using either developable strips or planar quadrilateral surfaces. Through the geometric concept of apparent contours and by the systematization of a process inspired by traditional projective geometry an algorithm is built, using the newest and outstanding CAD processes. They systematize and allow obtaining single-curvature strips or flat facets, in order to be able to address its construction, using materials that can be bent in one direction or rigid material with no possibility of being bent at all by simple and economical procedures. These strips obtained are from the geometrical viewpoint absolutely developable. They are patches extracted from cones or cylinders. The main subject to be developed in this paper is on one hand showing of the system and its geometric basis and on the other the exhibition of the results that are being obtained over physical models and prototypes built in diverse materials. Solar walls can be used to increase the overall energy efficiency of a building. Phase Change Materials (PCM) are capable of increasing the effective thermal mass of building elements, thus decreasing the overall energy consumption. Recently, the incorporation of PCM in a solar wall has been proposed, aiming to increase the total energy efficiency of the system. 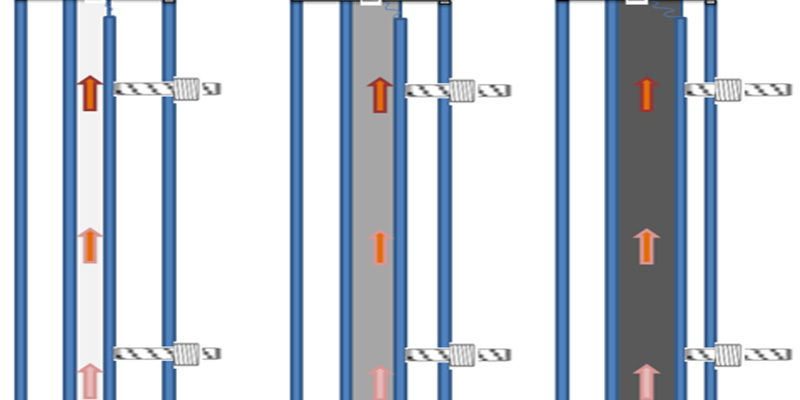 The main scope of this work is to investigate the thermal behaviour of a PCM-enhanced solar wall (PCMESW), using experimental and numerical simulation techniques. A prototype PCMESW is installed in a large-scale test facility and is exposed to dynamically changing climate conditions. A broad range of sensors, used to monitor the time-evolution of several important physical parameters, is employed to assess the dynamic response of the PCMESW. In addition, a Computational Fluid Dynamics tool is used to numerically investigate the thermal behaviour of the PCMESW prototype. Predictions of the developing flow- and thermal-field in the PCMESW’s air cavity are validated by means of comparison with the obtained measurements; in general, good levels of agreement are observed. Results of the numerical simulations may support the design optimization process of innovative PCMESW systems. The challenges of achieving the 2020 goals in terms of energy savings and improving efficiency are guiding numerous research initiatives looking for more insulated envelopes, dealing with thermal performance of insulation materials and envelope systems. Nevertheless, the envelope integrates within the building and this improvement on the insulation performance has to be properly adopted, taking into account the interrelation of main elements composing the overall system (facade, frame, slabs, openings, partitions etc. ), as well as side effects originated not only for new erected buildings, but specifically in renovation and retrofitting works. 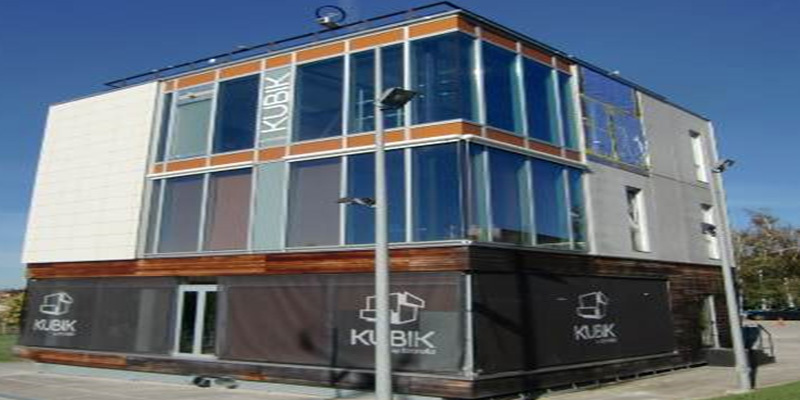 This paper describes real experiences when considering various options for upgrading the facade through the increase of the insulation capacity, starting from external overcladding prefabricated panels and ventilated facades, advancing to more sustainable low carbon systems and ending with even more highly insulated solutions employing aerogels. Lessons from these cases, where energy and hygrothermal assessments have being carried out, demonstrate the influence of the design and construction phases and the relevance of disregarded effects such as minor thermal bridges, uncontrolled craftsmanship on site, and moisture transfer for the different technologies considered. Finally, possible alternatives are provided to overcome some of the detected difficulties, such as combination with non-metallic structural components and building membranes, and being prepared for future challenges and new developments when these isolative elements are combined with other technologies, as for example, renewable energy harvesting devices.